Not least among achievements of Cuba’s socialist revolution is expanded political participation, even exercise of power, among formerly disadvantaged groups.RafaelHernández, editor of the Cuban journal “Temas,” details this story. He studied participation and entry into leadership positions in terms of age, gender, race, and profession. He mentions one consequence of inclusion that may be problematic. 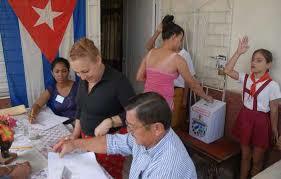 Hernándezadvances Cuban Communist Party (PCC) membership as a measure of political participation. The combined membership of the PCC and Union of Young Communists (UJC) numbered 1,175,148 in 2012 – 22.1 percent of Cuba’s labor force that year. Of PCC members, 35 percent are of African descent, a figure equal toHernández’s estimateof the proportion ofAfrican-descended people among all Cubans.Afro-Cubans make up 42 percent of UJC members. Women make up39 percent of party members and 52 percent of UJC members. The median age of PCC members is 50. Political activism, therefore, is common, and former disadvantaged groups are participating in numbers proportional to their presence in the general population. The question of whether or not they are moving into high political positions promptedHernándezto look at who leads in the PCC and Cuban state. For example, 114 members of the PCC Central Committee have a median age of 57 years; 42 percent are women. and 31.5 percent are non-white. Those filling PCC leadership roles overwhelmingly are economists, engineers, and teachers. The average age of 16 PCC provincial first secretaries is 46; six are women, and 25 percent are non-white. PCC heads in 167 municipalities are young, with only one older than 50. Generally, 28.6 percent of PCC leaders in Cuba’s provinces are Afro-Cuban. At high levels of Party leadership old patterns persist. The average age of 14 members of the PCC’s Political Bureau (PB) is 68.6. Only one is a woman. Four are either black or of “mixed race.” Seven are current or former military officers of whom three are involved mainly with civilian affairs. At a lower level of PCC leadership, the six members of the Party Secretariat are physicians, teachers, an economist, and an academician. Two are non-white, one is a woman, and their median age is 60. The National Assembly of People’s Power, constitutionally the “supreme organof state power,” warrants first consideration regarding leadership of the Cuban state.The average age of 614 Assembly delegates is 49.Women make up 45.25 percent of them. Over 35 percent are of African descent.Two National Assembly vice-presidents are women. So too are more than half the presidents of 16 provincial assembles. They make up 45 percent of provincial assembly delegates. Almost all provincial assembly presidentsare younger than 50 years of age. The National Assembly elects the Council of State (CS) which legislates between sessions of the National Assembly and is “the supreme representation ofthe Cuban State.” CS members in 2013, 31 in all, included 13 women and 12 Afro-Cubans. Of six Council vice presidents two are women, oneis Afro Cuban. The Council of Ministers (CM), charged with executing and administering legislation, comprises 33 members of whom 25 percent are women. Members’ average age is 58. Of eight CM vice-presidents, five are more than 70 years of age; there are no women. Nine CM members have military backgrounds, although seven of them deal primarily with non – military matters. Concluding, Hernández notes a disparity between restricted entry into high leadership positions and ready openings at lower organizational levels. But characteristics of people entering the PB, CS, and CM during President Raul Castro’s two terms suggest to him change is on the way. They are relatively young, mostly civilian, and with experience – some of them – in provincial leadership posts. .
1. Fitzgerald, Frank T., “The Cuban Revolution in Crisis – From managing socialism to managing survival,” pp 69-70, New York, Monthly Review Press, 1994.